The flowering of cherry blossoms trees is a telltale sign that winter’s misery is coming to an end in Japan, but it isn’t just the cherry blossoms that are undergoing change: springtime in Japan is characteristically marked by change in many facets of life. April 1st, in particular, signals a new start to the government’s fiscal year; a new start to the Japanese school year; a new start to many real-estate leases; and many employees begin a new job on this day. Certain things, though, hold their appeal by being impervious to change. This is certainly the case when it comes to the Kumano Kodō, one of only two UNESCO World Heritage pilgrimage routes in the world and the destination for a recent weXplore outing focused on hiking, trail preservation and experiential learning. What are the Kumano Kodo? The Kumano Kodō are a series of pilgrimage routes that wind through the mountains and cedar-filled forests of the Kil Penninsula’s Kumano region. Since ancient times the followers of Japan’s Buddhist and Shinto religions have believed the Kumano region to be inhabited by gods, associating its mountains, trees and waters with serenity and healing. These natural landmarks are marked along the trails by “oji” — small Shinto shrines where pilgrims can stop and offer prayers. At the center of the pilgrimage are the three Grand Shrines of Kumano (Sōhonsha), collectively known as the Kumano Sanzan: Kumano Hongu Taisha, Kumano Hayatama Taisha and Kumano Nachi Taisha. At one time, each of these shrines embodied its own form of nature worship; as time went on and the influence of Buddhism set in, the three shrines became associated with Buddhist gods, and eventually collectively worshipped as the three deities of Kumano. 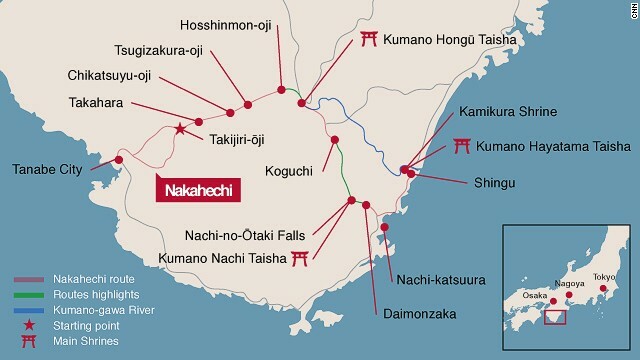 The origins of the pilgrimage trails themselves date back over 1,000 years, when Japan’s imperial family and aristocrats would make the journey on foot to worship at the Sōhonsha. As time went on the shrines popularity increased, leading to ever more pilgrims, mostly commoners, making the at-times treacherous journey through the mountain terrain. The Kumano Kodō eventually grew so popular that the endless streams of marching pilgrims became known as “the ant processions to Kumano” (蟻の熊野). Traversing the entirety of the Kumano Kodō in ancient times would take weeks if not months, but luckily for us, bullet trains and other modern forms of travel have significantly cut down on the time needed to enjoy the trails. Our time spent on the Kumano Kodō included a visit to the Kumano Hongū Taisha shrine as well as a visit to its former location (flooding destroyed the original shrine in 1889) , better known as Oyunohara (大斎原). In front of the Oyunohara stands the world’s tallest torii gate — a colossal structure that took six months to build and an additional six months to erect. 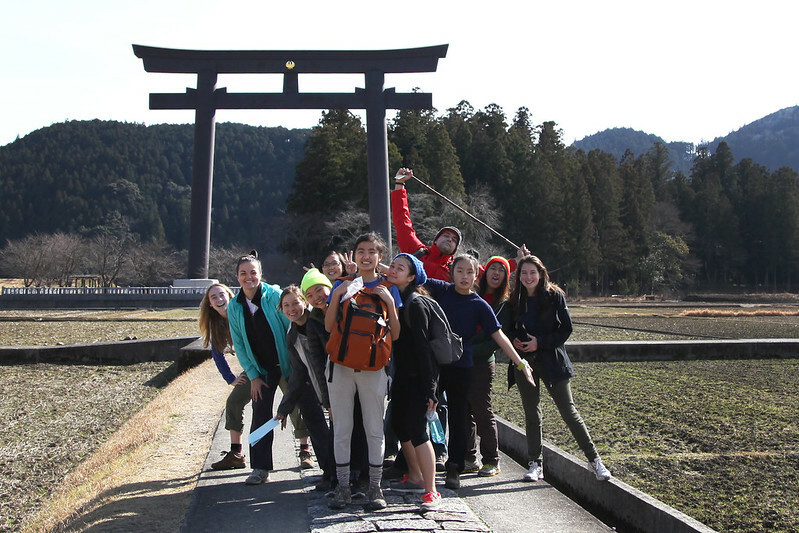 Our students were given the option of a moderate walk or a challenging hike to get between the locations, and most had the opportunity to also visit the Hosshinmon-Oji (gate of awakening of the aspiration to enlightenment) during their visit. 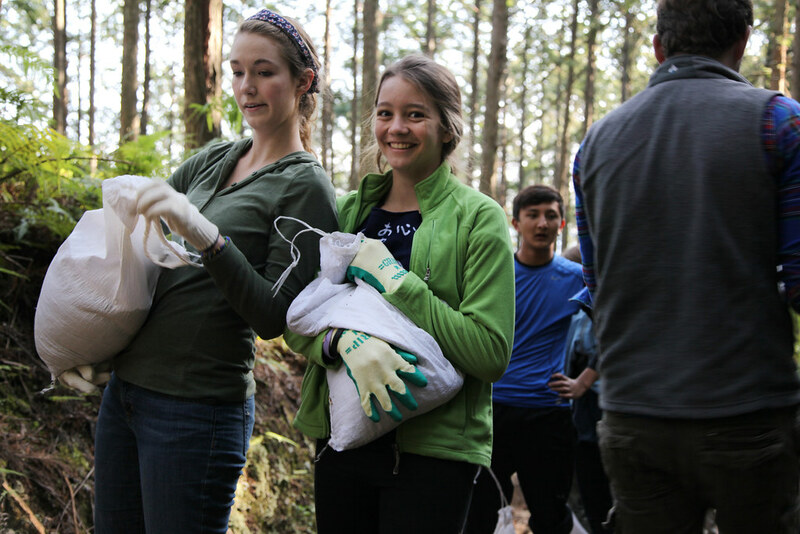 On the day following our visit to the Kumano Kodō, our students returned with gloves in hand to volunteer in the pilgrimage route maintenance program. For several hours, each student aided in carrying bags of dirt up and down the trail and pounding it into place where rain had previously washed it away. Human energy has been the driving force in maintaining the Kumano Kodō since its inception, and our students were eager to play their part in sustaining it for future marvelers. All in all, it was a fascinating trip and a wonderful opportunity to experience and maintain Japan’s natural beauty. If you are ever in Japan, we’d highly recommend taking a day or two to experience the Kumano Kodō for yourself. Photos from our trip can be found below. Until the next trip, sayanora!